Why these three chords written on the top of the treble clef (Am7/G, D7/F# and G) don’t correspond to the notes on the partition ? Is it chords that can be played with the left hand instead of notes on the bass clef ? In the first measure you have G, C, E and then A up above, which would be a Am7 and the G is in the bass so that is correct. The F# is a leading tone down to the next measure and is a non-chord tone. In measure two you have F#, A, C and E, then the E moves to D. If you ignore the E for a second you have F#, A, C, and D which is a D7 with the F# in the bass. the E is just a passing tone/ Non-chord tone. The G is a straight G triad as labeled (G, B, D, with G on top, which moves to D later in the measure). Those chords actually do correspond exactly to what is written. 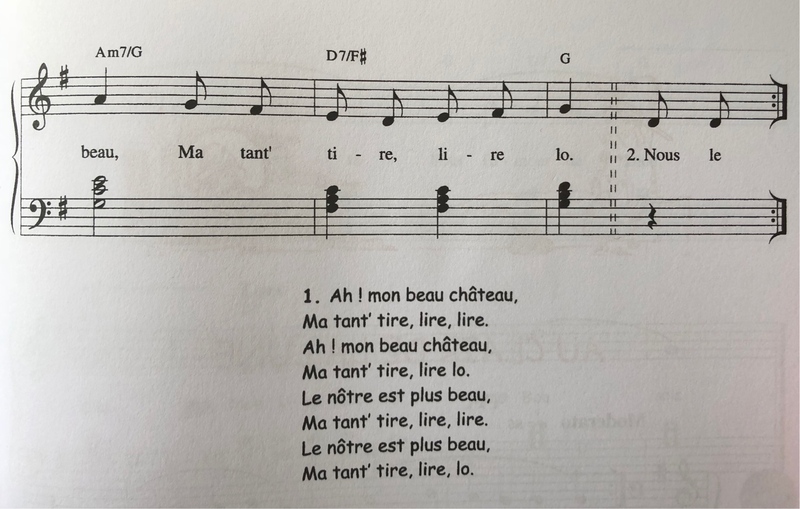 One thing to keep in mind is that the A in the melody in the first measure and the D in the melody in the second measure are part of the chords. The top staff indicates notes played by the right hand, and the bottom staff indicates notes played by the left hand, regardless of where those notes are on the piano. If the left hand plays notes above middle C, then those notes are still written on the bottom staff, and have to be indicated with ledger lines, just like if it were a single bass clef staff that wasn't part of a grand staff. While I've seen some beginner piano music have melodies or chords cross into the other staff when they pass middle C, most piano music doesn't do that. In the example, the top note on the first chord is the E above middle C. That note could be written as the bottom line of the treble clef staff, but since it's played by the left hand, it has to be on the bottom staff, which is in bass clef, so it has to be written with ledger lines. While this isn't relevant for this example, it's also worth noting that the top staff doesn't have to be treble clef, and the bottom staff doesn't have to be bass clef. If both hands are playing mostly above middle C, then it's usually written with both staves in treble clef, and if both hands are playing mostly below middle C, it's usually written with both staves in bass clef. Not the answer you're looking for? Browse other questions tagged piano chords notation or ask your own question. New to piano, and Treble Clef turned into a bass clef (giving me two bass). How would I play the notes? Which would be middle c?